ISLAMABAD, Pakistan (CNN) -- A key commander of the Pakistani Taliban has been wounded in the ongoing military offensive in northwest Pakistan, a military spokesman said Wednesday. A newspaper mughshot photo purporting to be of Maulana Fazlullah. Maj. Gen. Athar Abbas had no details on the extent of Maulana Fazlullah's injuries sustained in a military offensive in Swat Valley. He is known as the "Radio Mullah" because of his inflammatory radio broadcasts. Fazlullah has stated that his goal is to impose a harsh interpretation of Islamic law in northwest Pakistan. Hours before Abbas spoke, a suspected U.S. drone attack killed eight militants and wounded five others Wednesday when it struck suspected hideouts connected to Taliban leader Baitullah Mehsud in northwest Pakistan, according to Pakistani officials. A Taliban official confirmed the attack on the village of Karwan Manza in South Waziristan and said some of the group's fighters had been killed. The missiles struck a tent area where a group of Taliban fighters had set up, a local resident said. Later in the day, second drone attack in South Waziristan killed 17 people, according to a Pakistani intelligence source, who said the attack targeted a convoy of vehicles moving toward a Baitullah Mehsud Camp. An army source said five vehicles were hit but refused to speculate on the number of casualties. The incidents comes a day after another suspected drone attack in South Waziristan near the border with Afghanistan. In that incident, a suspected U.S. drone attack killed at least 12 people and wounded five others. 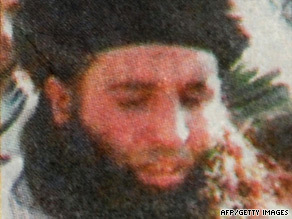 Fazlullah's father-in-law, pro-Taliban leader Sufi Mohammed, helped mediate a peace agreement with the Pakistani government earlier this year. That deal collapsed, and paved the way for Pakistan's current military operation against Taliban elements in the northwest. Mohammed was released from jail last year in an effort by Pakistan's new civilian government to reach a broader peace agreement with tribal leaders. He was detained in 2002 after recruiting thousands of fighters to battle U.S. forces in Afghanistan. Sufi Mohammad helped mediate a peace agreement with the Pakistani government earlier this year. That deal collapsed, and paved the way for Pakistan's massive military operation against Taliban elements in the northwest. Shortly after his father-in-law's peace deal took effect, Fazlullah proclaimed himself the Emir of Swat. Swat Valley was once one of Pakistan's biggest tourist destinations. It is near the Afghanistan border and is 300 kilometers (186 miles) from the Pakistani capital, Islamabad. The central government has long exerted little control in the area. Pakistan is under enormous pressure to control the militants within its borders, blamed for launching attacks in neighboring Afghanistan where U.S. and NATO forces are fighting militants. The United States -- using unmanned drones -- has carried out several airstrikes inside Pakistan on suspected militant targets. While Pakistan's military operation is unpopular among some Pakistanis, efforts to deal diplomatically with militants have not worked in the past. Pakistan's previous leader, Gen. Pervez Musharraf, reached a cease-fire deal with militants in South Waziristan in 2006 which was widely blamed for giving al Qaeda and the Taliban a stronger foothold in the region. Journalist Janullah Hashimzadeh contributed to this report.